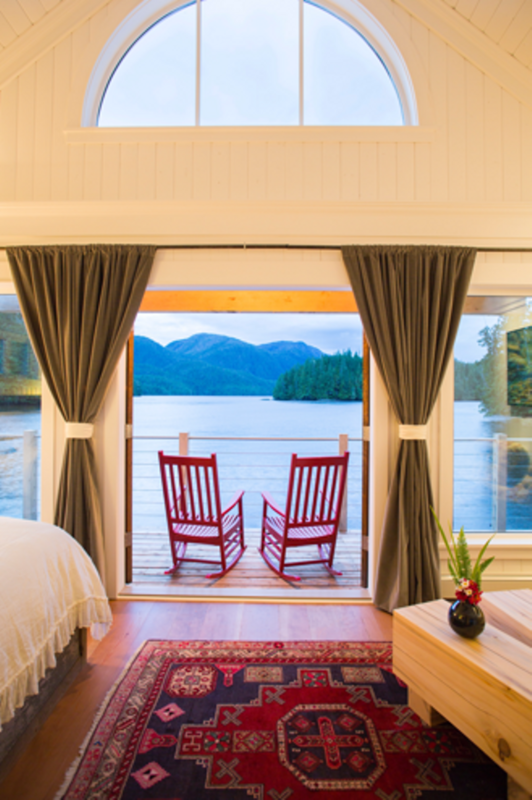 There is good news for procrastinators as space has opened up in May to visit the award winning Nimmo Bay Wilderness Resort on British Columbia’s west coast, providing a rare opportunity unless you were lucky enough to book your summer trip well in advance. Nimmo Bay’s more than 30 years years as one of the top wilderness lodges in the world means that summer seasons are sold out well in advance. Global travellers have long discovered it is the perfect place to tune into the rhythms of nature and tune out of the stresses of everyday big city life, filling up the resort which can accommodate up to 18 guests at one time from May to October. Romantic and intimate, while also family friendly – thanks to the owners’ own growing family of young wilderness aficionados – Nimmo Bay also attracts male bonding and girlfriend getaway trips throughout the year. Now, the May Experience at Nimmo Bay is the antidote for those who crave a pre-summer escape at value-based prices. Offered only in May (with a three-night minimum stay at double occupancy) it was designed for those who are looking to get away from the city and try out forest bathing and all the other experiences in nature with proven health benefits. The daily rate for the May Experience package is $1,195 Cdn per person and is ideal for couples, families, or a group of friends looking for the chance to reconnect. It includes accommodation in beautifully appointed cabins, all meals, and daily scheduled activities which include group yoga classes; rainforest hikes; kayaking trips to the coastal islands of the Broughton Archipelago; and stand-up paddle boarding jaunts. Add-on activities and day trips (at additional charge) include massages in the gorgeous new spa spaces artfully built into the forest, excursions by private boat and outings by helicopter from lush river valleys up to mountaintop glaciers. The experience includes round-trip floatplane transfers from Port Hardy Airport (on Mondays and Thursdays, the resort’s scheduled travel dates; transfers on other days have additional coast); daily scheduled activities; accommodation in a private cabin; three gourmet meals per day and house wine, spirits and local beer. Taxes and gratuities; add-on activities, full-day excursions and helicopter trips; massage and spa service; premium alcohol; and fishing licenses are additional. Nimmo Bay Wilderness Resort is an intimate family owned and operated resort located in the middle of the Great Bear Rainforest in British Columbia. Guests of Nimmo Bay will find themselves exploring the beautiful wilderness either on land, on water, or by flying in a helicopter. The Resort was named one of the National Geographic Unique Lodges of the World in 2015, joining a collection of properties worldwide committed to sustainable travel. Nimmo Bay Wilderness Resort is accessible only by air or water. The resort itself is the only development in the area and there is no road access. From Seattle, direct flights via floatplane are available with either Kenmore Air or Northwest Seaplanes. From Vancouver (YVR), via Pacific Coastal Airlines it is a one-hour flight to Port Hardy (YZT) or 1.5 hours away via a direct float plane charter. From Port Hardy, guests may reach Nimmo Bay Wilderness Resort via floatplane or helicopter. Nimmo Bay Wilderness Resort is happy to arrange transportation from Vancouver or Port Hardy for guests. For more information about Nimmo Bay, call 1-800-837-4354 or, visit www.nimmobay.com.